Yahoo on Monday announced it has reached a $1.1 billion agreement to buy Tumblr, the popular microblogging platform with a strong presence on Apple's iOS. In the company's press release, Yahoo said it "promises to not screw it up" in buying out Tumblr. The search company's handling of photo sharing site Flickr, which it acquired in 2005, is one prominent example as to why some have expressed concern over the Tumblr deal. Tumblr has more than 300 million monthly unique visitors and 120,000 signups every day. The platform sees 900 posts per second and 24 billion sites spent on the site each month. Among users on the go, more than half are using the official Tumblr mobile applications, available for Apple's iOS and Google's Android. The universal Tumblr app for iOS is one of the most popular free social networking applications available on the App Store. As of Monday morning, Tumblr was the fourth most downloaded free application in the App Store's "Social Networking" category, with nearly 164,000 user reviews giving an average score of four stars out of five. Yahoo said Tumblr will be able to deploy its personalization technology and search infrastructure to help users discover content and other users. Tumblr will also bring 50 billion blog posts to Yahoo's media and search experiences. "Tumblr is redefining creative expression online," said Yahoo! CEO Marissa Mayer. "On many levels, Tumblr and Yahoo! couldn't be more different, but, at the same time, they couldn't be more complementary. "Yahoo is the Internet's original media network. Tumblr is the Internet's fastest-growing media frenzy. Both companies are homes for brands  established and emerging. And, fundamentally, Tumblr and Yahoo! are both all about users, design, and finding surprise and inspiration amidst the everyday." Tumblr Chief Executive David Karp attempted to ease concerns among his site's community, assuring users that the team and roadmap are not changing. "We're elated to have the support of Yahoo! and their team who share our dream to make the Internet the ultimate creative canvas. 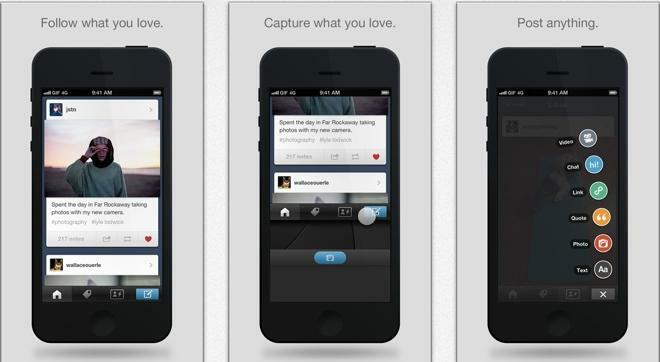 Tumblr gets better faster with more resources to draw from," Karp said. An update for the official Tumblr app was coincidentally issued on Monday. Version 3.3.2 adds a "fancy" new post type chooser, as well as app attribution on posts.